INCHELIUM -- Imagine bringing your kids to the lake and wondering if they'd be better off at home, watching TV. Or washing your garden-grown vegetables and wondering if it would be healthier to eat canned ones. Or digging for clams and mussels and wondering if they're laden with lead and zinc, mercury and arsenic. These are the worries of some who live along the upper Columbia River, especially Lake Roosevelt, a 150-mile-long stretch of the Columbia River, and the repository for much of the 10 million tons of slag that a Canadian smelter just north of the border dumped into the river for decades. Over the last 20 years, several studies have been done to find out if Lake Roosevelt's water is safe to swim in, its beaches are safe to play on, and its fish are safe to eat. So far, only a fish advisory warns people to limit the number of fish they eat. But additional risk assessments are needed before the issues to human health are known. Studies are now under way to test the toxins in river sediment. More studies are planned to test for heavy metals in upland soils polluted from years of fallout from the smelter's smokestacks. So far, everyone agrees that visitors on this popular camping lake have little to worry about. But officials from the Confederated Tribes of the Colville Reservation say that doesn't mean it's safe -- day in and day out for years on end -- to eat food grown in nearby soils, create steam with its water for a sweat lodge, or let children play in its sand every day, as if this were just any sand. "We just want to see the river cleaned up, and I would like to think this is the vision of everybody that's close to this," said Michael Finley, chairman of the Confederated Tribes of the Colville Reservation. Last December, a federal judge ruled that Teck Metals Inc., which has operated a smelter in Trail, B.C., for more than a century, is is liable under U.S. law for assessing pollutants in the lake. But with the court process still incomplete, tribal officials worry Teck will continue to fight the ruling, and it will be years before any real cleanup begins. "We haven't really begun to wrap our arms around how big this is," Finley said of the looming cleanup. He said the Colvilles have taken the lead to push for action out of a concern for future generations. "My kids, my grandkids and everybody else who's going to make use of the river" will benefit. Finley said despite lean budgets, the Colville Business Council has always voted to continue to fund the studies and legal battle to restore Lake Roosevelt. "We are up to tens of millions of dollars since it started. We're going to continue to fund it until we get the resolution we think we're going to get." It's been 14 years since the Colville Tribes petitioned the federal government to clean up Lake Roosevelt. After an initial investigation, the Environmental Protection Agency issued an order in 2003 to Teck Cominco Metals under the U.S. Superfund law requiring it to fund studies and clean up the river. Now called Teck Metals Ltd., the Canadian company's zinc and lead smelter in Trail, B.C., is among the world's largest. When the company didn't respond to EPA's order, Colville Tribal leaders filed a lawsuit against Teck for failing to comply with the federal order. Last year -- nine years after the lawsuit was filed -- U.S. District Court Judge Lonny Suko found that for 65 years, Teck intentionally polluted the Columbia River, and that company officials knew that heavy metals from their smelter and refining operation would settle out in this dam-made lake in the United States. 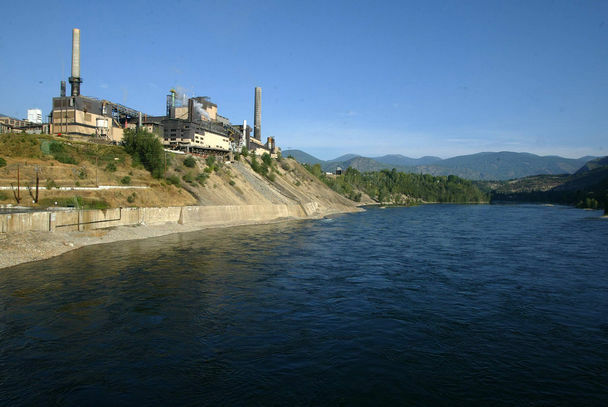 Suko also found that Teck knew its actions would likely cause harm, and determined that the company is liable to the Colville Tribes and to Washington state for assessing, and -- if necessary -- cleaning up the pollution. Even by the early 1990s, when Washington state and EPA officials started pressuring Teck to stop dumping slag into the river, Teck did not stop, Suko wrote. "Profits were 'excellent' -- $100 million per year -- and it continued to discard slag at a rate of 400 tons per day and sewer effluent flowed from its facility 24 hours a day," his findings state. Company officials, he wrote, "recognized that Trail had, essentially, been using Lake Roosevelt as a 'free' 'convenient disposal facility' for its wastes." The slag dumping came to an end in 1995. "Teck was forced to cease slag river discharge when the government of Canada investigated the toxicity of its slag and demanded that it stop," Suko wrote. David Godlewski, vice president of environment and public affairs for Teck American Inc., said the company has spent over $55 million on studies and cleanup efforts since a 2006 agreement with the EPA to work on reclaiming Lake Roosevelt under Superfund laws, without admitting liability. He said the studies have been thorough and complex, and numerous parties have been involved, adding to the length of time it's taken. "As a company, we've never missed a deadline on anything we've submitted," he said, adding, "My goal is to make sure we fulfill the settlement agreement." Finley said that agreement was made without input from the Colville Tribes, and is taking the bite out of their ability to force compliance through their recent court victory. Nearly a year after Suko's decision, he and other tribal officials remain frustrated that cleanup still seems like a distant dream. Suko's ruling confirmed that Teck dumped at least 9.97 million tons of slag into the Columbia River between 1930 and 1995. At least 8.7 million tons of it traveled into Washington. The other 1 million tons is still in Canada, and continues to make its way south. After years of disputing it, Teck admitted that the slag is not inert, but continues to leach toxins into the water. State and federal officials say it's hard to describe the magnitude of pollution from the smelter. "I think the facts speak for themselves," said Mary Sue Wilson, a senior assistant for the state Attorney General. "We're talking about such high volumes, over a long period of time, and it all ended up in the upper Columbia River, and Lake Roosevelt. Just given the nature of the substances and the high volume, it is of significant concern to the state," she said. The state joined the Colvilles early in the case. It has taken longer than most, Wilson said, largely because the pollution originated in Canada, so they had to convince a federal judge that the company is still liable under U.S. law. "It's been a priority for the state, and I think, worth the effort," she added. Studies so far have focused largely on human health issues. In 2009, the state Department of Health conducted what it called "the most extensive and thorough chemical monitoring effort in Washington state to date," evaluating data on 385 chemicals from some 2,300 fish samples, including nine species taken from six areas on Lake Roosevelt. The advisory found that mercury and PCBs were found in high enough levels to recommend limited meals, ranging from 2 meals of large-scale suckers per month, to three Kokanee per week. Those levels are slightly higher than levels seen in other fished waters in the northeastern part of the state, the agency says. In other studies, the state Department of Health concluded that people can touch, breath or accidentally eat sand from its beaches, assuming they are exposed only two days a week for four months, or 35 days a year. Dust in the air when lake levels are low, and the wind picks up slag dust has not yet been evaluated. Water from three water systems around the lake were deemed safe for drinking, cooking, and showering or bathing. Brook Beeler, spokeswoman for the state Department of Ecology, said even if no human health issues are identified, Lake Roosevelt and its shores are polluted, and need to be cleaned up. "There's been damage to the environment, and it's our job to protect that, and make sure it gets restored, the best it can be," she said. Beeler said that the issue impacts more than just the Colville Tribes. "It's part of a larger watershed," she said. The Columbia River basin, she said, "is a huge state resource." If it's polluted, people won't go there to fish or recreate. "It's not just for the people who live around there," she said. "It impacts our economy." At Black Sand Beach, just three miles south of Canada, Teck paid to have 9,100 tons of sand removed and replaced with clean sand in 2010. Although the site was never deemed a public hazard, its black sand is the result of decades of slag deposits. Tribal officials say it's the only place on the 150-mile long lake where any cleanup has occurred. And already three years later, evidence of continued slag deposits can be seen in the water and along the shoreline. Lake Roosevelt is not a Superfund site, but due to a 2006 agreement between Teck and the EPA, it is being assessed under Superfund laws. But there are still many studies to conduct, including an in-depth look at heavy metals in surrounding soils that is now underway, said Laura Buelow, EPA's project manager for the site. A study on metal concentrations in mussels and crayfish may occur in 2015, she said. There may also be follow-up studies to conduct. "By the time we have a document out with a risk assessment, we're looking at another five-plus years," she said. She said 10 million tons of slag that Teck dumped into the Columbia River system is certainly a lot by any standards. "The big question is, really, how hazardous is that? That is what we're working on."